For other people with the same name, see Harry Osborne (disambiguation). Harold "Harry" Osborn alias "New Goblin" or "American Son" is a fictional superhero and ex anti-hero in the Marvel Comics Universe. The character first appeared in The Amazing Spider-Man #31 (December 1965), and was created by Stan Lee and Steve Ditko. He is Peter Parker's best friend, the son of Norman Osborn, and the second iteration of Green Goblin. The character has appeared in many adaptations of Spider-Man outside of the comic books, including the 2002-2007 film trilogy portrayed by James Franco and appears in 2014's The Amazing Spider-Man 2 portrayed by Dane DeHaan. Harry Osborn first appeared in The Amazing Spider-Man #31 (December 1965), and was created by writer Stan Lee and artist Steve Ditko. In The Amazing Spider-Man #122 (July 1973), Harry's father, Norman, is killed off, and a subplot leading to Harry Osborn inheriting his father's identity as the Green Goblin is introduced. This subplot culminates in The Amazing Spider-Man #136 (September 1974). Writer Gerry Conway said that the idea of Harry Osborn becoming the Green Goblin stemmed in part from a desire to deal with the consequences of the psychedelic drugs Harry began using in The Amazing Spider-Man #96 (May 1971). Conway said that he had had experience with such drugs himself, and that "with psychedelic drugs, hallucinogens, if they've been misused, there's a potential for additional hallucinogenic experiences that are completely beyond your control or volition. I could imagine Harry getting hit by something like that, in the fragile emotional state following the death of his father, and losing touch with reality, as a result. Besides, I never had any intention of getting rid of the Green Goblin as a concept forever, so it all came together." Following his death in The Spectacular Spider-Man #200 (May 1993), he was not seen until his resurrection in The Amazing Spider-Man #545 (December 2007). He received an entry in the Official Handbook of the Marvel Universe Update '89 #5. Harry Osborn is the son of Norman Osborn and Emily Lyman. The circumstances of Harry's birth weakens Emily, and she dies after a long illness. Heartbroken, Norman becomes a cold and unloving father; Norman either contemptuously dismisses Harry or lashes out at him in fury. As a result, Harry spends much of his life trying desperately to earn his father's approval. Upon graduating from high school, he enrolls in Empire State University. Among the wealthiest students in the school, Harry soon becomes one of the most popular as well, despite his aloof manner. He has a clique of rich, popular students around him; one of these is the lovely Gwen Stacy. Gwen is intrigued by a new student: bookish, studious and painfully-shy Peter Parker. Harry takes a dislike to Parker; he resents the attention Gwen pays to Peter, and he assumes that Peter's standoffishness is snobbery. After confronting Parker, Harry realizes that Peter is merely shy and is also worried about his ailing aunt May Parker. Despite this rocky start, Harry and Peter became friends, eventually sharing an apartment. Harry does not realize that his best friend is the superhero Spider-Man, nor that his father became the supervillain Green Goblin in an accident while attempting to create a super-serum. Moreover, before he became friends with Harry, Spider-Man was unmasked and captured by Green Goblin. During the subsequent battle, an electric shock removed all memory of being Green Goblin from Norman's mind. Spider-Man then hid all evidence of Norman's double identity, to keep Harry from being hurt by the revelation. However, Norman's Green Goblin persona resurfaces from time to time. These are difficult times for Harry, as his father's periodic episodes are unexplainable. He had experimented with drugs in his teens; but he escalates his usage, as well as trying ever-harder substances. This affects his mental stability and his relationships with his friends. Spider-Man uses this to his advantage during one battle with Green Goblin; he is able to stop the fight by showing Norman his son's emaciated condition, brought on by an accidental cocaine overdose. The sight shocks Norman so much that it brings him back to sanity. Harry Osborn as the new Green Goblin, battling Spider-Man on the cover of The Amazing Spider-Man #136 by John Romita, Sr.
Harry Osborn is dumped by Mary Jane Watson due to being fed up with his self-destructive lifestyle. Disconsolate, Harry turns to drugs and suffers an amphetamine overdose. He survives, but this tragedy, compounded by imminent bankruptcy, drives his father over the edge. He kidnaps Gwen as bait for Spider-Man, and then throws her off the George Washington Bridge (or Brooklyn Bridge). In a vicious battle with Spider-Man, the Green Goblin accidentally impales himself on his own goblin glider. Harry Osborn secretly witnesses this. Wanting to protect his father's identity, he strips Norman Osborn's body of the Green Goblin costume to hide. Blaming Spider-Man for his father's "murder", Harry, angry and mentally unbalanced, swears vengeance. Having inherited his father's company, Harry manages to get the business back in shape. One day, to his shock, he finds a Spider-Man costume in Peter Parker's apartment and realizes that his best friend is the man he blames for his father's death. Using his father's old equipment, Harry confronts Peter as the second Green Goblin. Not wanting to hurt Harry, Peter avoids fighting his old friend. After Spider-Man is able to thwart Harry's initial attempt on his life, Harry is knocked unconscious and taken into police custody. There, he raves that he is the true Green Goblin and Peter Parker is Spider-Man, but is dismissed as a lunatic. He is put in the care of criminal psychologist Dr. Bart Hamilton to extract the Green Goblin secrets from Harry through hypnosis, and buries the knowledge deep within Harry's mind. Hamilton then raids one of Harry's hideouts and becomes the third Green Goblin. Meanwhile, Harry is released and considered cured. He sustains a concussion that makes him forget his knowledge of Spider-Man's identity and he and Peter rekindle their friendship. For a while, Harry's life seems back on track; his company begins turning profits once more, and he develops a romance with Liz Allan after they meet at the wedding of Betty Brant and Ned Leeds. Not long after the two are married, and eventually they have their son Normie Osborn named in memory of the boy's grandfather. Harry also gives his blessing to the marriage of Peter and Mary Jane Watson. However, Harry starts regaining his memories when he is blackmailed by the original Hobgoblin (Roderick Kingsley) with a package which contains evidence that his father was the original Green Goblin. When Hobgoblin learns he had raided all of Norman's hideouts, he leaves Harry alone, knowing he had nothing more to offer him. Later, Harry is forced to act as Green Goblin a few times, once to defeat the second Hobgoblin (Jason Macendale). This Hobgoblin is seeking the Goblin Formula that gave the Green Goblin superhuman strength; Harry is able to defeat him by doubling back during an aerial chase and emptying his entire supply of pumpkin bombs onto Hobgoblin. Harry even wonders if he could use the Green Goblin persona for a career as a superhero but Peter convinces him that Green Goblin had too much baggage for such a role. Harry buries the Green Goblin menace within his mind once more and focuses on his business and family. The death of Harry Osborn. This tranquility is shattered when the aftereffects of the "Inferno" crisis sunder the barrier between Harry Osborn's conscious and subconscious minds. Once again, he remembers being Green Goblin—and his hatred of Spider-Man. Harry has now convinced himself that Peter Parker resents the Osborns' "stable family life" due to never having been wanted by his own parents or guardians, when in fact it was the complete opposite. He uses Peter's trust in him to capture him, and subjects him to hallucinogenic gases to psychologically torment him. He finds himself unsatisfied with this revenge, however, and decides to kill Spider-Man. However, given the opportunity he proves unwilling to kill his best friend. Harry investigates his father's old hideouts and notes, and finally uncovers and ingests the formula for the original Green Goblin's superhuman strength. He then kidnaps his wife, son, and brother-in-law Mark Raxton, terrorizing them in an old family mansion. Raxton manages to signal their location to Spider-Man who defeats the Green Goblin and turns him in to the police. Spider-Man pushes for Harry to get psychiatric treatment from Dr. Ashley Kafka, but he is ultimately transferred to the Vault. However, the state is unable to put together a sufficient case against Harry, and after just a few weeks in prison he is released. Harry discovers that his father developed an advanced version of the Green Goblin strength formula, but was unable to test it before his final battle with Spider-Man. After testing it, he ingests the new formula. When he spies Spider-Man investigating his townhouse, Harry loses his temper and attacks him as the Green Goblin. He injects Peter with a drug that leaves him immobile and, in a fit of depression, activates timed explosives that he had planted throughout the townhouse, planning to kill both himself and Peter. However, when he realizes that Mary Jane and his son Normie are also in the townhouse, he is shocked back to his normal self. Harry rescues Mary Jane, Normie, and Peter before he collapses. He belatedly realizes that he did not test the new formula diligently enough, and that it is in fact lethal. Some time before his death, Harry Osborn created a computer system with copies of his and Norman Osborn's minds programmed into it; after Harry's death, the computer system activates and abducts Normie Osborn with the intent of subjecting him to the Green Goblin Serum (the same one that had caused Harry's death) to make into the newest Green Goblin. This computer facsimile of Harry and its robotic drones (which resemble female versions of Green Goblin) were all destroyed by Spider-Man and the Molten Man who manage to save Normie from it. However, Harry had one last trick up his sleeve. Some time before his final confrontation with Spider-Man, Harry had employed the Chameleon to construct Life Model Decoys of Peter's parents to play with his emotions. The plot ends with both constructs revealed as fakes when both "die", shattering Peter's mind. After nearly killing the Chameleon, Peter found a tape Harry had left before he died revealing his role in the plot and mocking Peter, demonstrating that Harry was as manipulative and cruel as his father when gripped by insanity. Peter goes temporarily insane from the shock, even briefly rejecting his identity until the return of his clone Ben Reilly snaps him back to reality. It is subsequently revealed that Harry Osborn's supposed death is faked by Mysterio and his father who spirits his son away to Europe where he is held prisoner in several "rehab" clinics and believes that his son had relapsed into drug addiction, and this in turn led to his brief return to wearing the Green Goblin costume. At some point, Harry is released from rehab and reunites with his friends. However, because of the machinations of his father and the mindwipe of the world's knowledge of Spider-Man's secret identity by Dr. Strange and Reed Richards, Harry no longer remembers that Peter Parker is Spider-Man. His marriage to Liz Allan also disintegrates and the two divorce. Harry engages in a string of relationships, several of which result in Harry marrying and divorcing in rapid fashion. He is in a relationship with Lily Hollister. Harry tries to help Lily's father in the latter's bid for Mayor of New York by funding her father's campaign with his dwindling finances. Harry is also one of the leading suspects for the secret identity of the New Goblin. In the "New Ways to Die" story arc, Menace battles Norman Osborn and is infuriated when Norman states that all he cares about is killing Spider-Man. Norman dons the Green Goblin costume and mentions that Harry has been in the Green Goblin's lair. Norman calls Harry who realizes from Norman's distorted voice that Norman is wearing the Green Goblin suit. This horrifies and disgusts Harry who vows to stop his father. Harry angrily confronts his father who wants Harry to follow his legacy and become a greater man. The confused Harry is saved by Spider-Man. Spider-Man, who wants to beat Norman senseless, stops when he sees an area for Human Testing. Harry is claimed to be the one responsible for the atrocious acts although he attempts to plead innocence. Harry later states that he wants to talk to Peter, who moments earlier was kissed by Lily, and is seen leaving with a mysterious canister labelled "Prometheus X-90". Prometheus X-90, it is revealed later, was developed as a successful cure for Mark Raxton's condition as Molten Man. The only human test subject was Charlie Weiderman, the short-lived second Molten Man, and the only person on whom the serum could be tested. After the cure is administered, Liz finally forgives Harry and gives him back the wedding ring, which she originally claimed she lost. Renting out all of Liberty Island, Harry takes Lily there and, at the top of the Statue of Liberty, he gets down on one knee and proposes to her. Lily rejects his proposal because she is not sure where their relationship will lead, which surprises Harry. He later goes to her place to check up on her, and as he enters the room he is surprised to discover Lily wearing the Menace costume. She found a hidden door in his closet and one of his old journals. She begins giving him a hard time about whining so much about his father. Harry thinks her behavior is because she's sick. She continues to tell him she uncovered one of Norman's secret rooms described in the journal. This explains why she kissed Peter after the Thunderbolts attacked; he almost found the secret trigger to open the room. When she first entered the room she found the Green Goblin's equipment and some experiments. Knocking over some chemicals, she absorbed them and is now able to transform at will. She explains that she discovered Menace's attacks against her father gives him more public support. She also tells him that she accepts his marriage proposal. After their talk, Harry enters one of his father's weapons caches, takes a glider (filled with bombs and winged bombs), a pair of Goblin gloves, a sword, and a dart gun containing an unknown chemical. In the midst of a battle between Menace and Spider-Man, Harry confronts and shoots her with that chemical, which is a type of antidote that reverts her back to her human form. He saves Spider-Man from the crowd and leaves. Lily is incarcerated but later escapes, leaving Harry her ring and a note. Harry Osborn is approached by Norman Osborn with the offer of a job within his father's personal Avengers. Harry initially declines, but after a visit from Lily Hollister revealing that she is pregnant, he accepts. Norman welcomes him into Avengers Tower and wants to make Harry into the American Son. Harry is shown to have an ulterior motive, however, based on his need to protect Lily and his child. Disabling the camera in his room, Harry sneaks off. He finds a cure for Lilly's Green Goblin condition that will be safe for her and the baby but she pushes him away. Lily reveals that it is all a ruse to coerce Harry into becoming American Son, whom Norman would eventually have die in a tragedy to increase sympathy for Norman and his Avengers. She also reveals that the baby is not Harry's but in fact Norman's. In retaliation for this news, Harry dons his American Son armor and fights against his father using the Iron Patriot armor. During the battle, Norman declares that Harry is no longer his son and that he has bred a better child to replace the failure of Harry. After further taunts from Norman, Harry lashes out and defeats his father, declaring "I was never your son!". When Harry has the option of killing Norman, Spider-Man tells him to decapitate Norman, since Norman's healing factor may repair a blow to the head. Spider-Man states that killing Norman will cause Harry to "become the son Norman always wanted". Harry backs down, and walks away from Norman forever. Harry is next seen in a psychiatrist's office, claiming to be getting over the effects of a medical treatment he received. The doctor offers to prescribe him oxycodone but it is not revealed if Harry takes the prescription. Afterwards, Harry is cut off financially and is forced out of his penthouse apartment. He moves into Peter's old room at May Parker's. He also begins secretly dating Amy Reilly (Peter's cousin). After May returns and is corrupted by Mister Negative, she kicks Harry out of the house, forcing him to move in with Mary Jane Watson. After Norman Osborn's fall, the American Son armor is stolen and the police begin questioning Harry as only someone of the Osborn bloodline can use the American Son armor. Harry is then shot in the chest by Gabriel Stacy, claiming that Norman gave Harry a better life. However, Harry is saved by American Son and taken to a hospital. After Harry recovers from his wounds, he is escorted home by police. Fearing the damage that could be done with the American Son armor and perplexed by his encounter with Gabriel, Harry decides to figure things out on his own. After enlisting the help of a talented reporter named Norah from Frontline, Harry decides to visit Norman as only he would know about Gabriel. Harry and Norah eventually visit the Raft where they find Norman in his cell consumed by madness. Harry demands to know about Gabriel but Norman is unresponsive. Frustrated, Harry and Norah begin to leave, but before they exit Norman briefly returns to his senses and tells Harry that Gabriel is indeed Norman's son. Trying to make sense of everything, Harry visits May Parker's work where he plans to volunteer. On his way, he realizes that he is being followed by the FBI. It is then revealed through FBI security footage that Gabriel is the one who stole the American Son armor and has been using the armor all along. Meanwhile, Gabriel confronts the American Son armor and is revealed to have developed a split personality similar to Norman's after his exposure to the Green Goblin Serum. This split personality explains to Gabriel that it represents all that is good in his soul and will use the American Son armor to undo each of Gabriel's crimes. After an intense psychological battle, Gabriel appears to gain the upper hand and proceeds with his plan. Still attempting to understand Gabriel's plans, Harry determines that in order for Gabriel to truly hurt him he will attempt to abduct an innocent person and lay a trap. Harry then rushes to find Norah. Meanwhile, the police arrive at Gabriel's hideout but are unable to rescue Norah because of the American Son's interference. Harry manages to sneak in through one of his father's secret tunnels and confronts his half-brother. As the police prepare to make another attempt to save Norah, Harry frees her and gets the young reporter to safety. With Norah out of harms way Gabriel and Harry engage in an epic battle. During the fight, Harry attempts to convince Gabriel that Norman is evil and that attempting to follow in his footsteps is madness. Gabriel refuses to listen and continues his attempts to kill Harry. Saddened by his brother's choice, Harry hacks the American Son armor and knocks Gabriel unconscious. The battle causes the warehouse to go up in flames, trapping Gabriel and Harry inside, but Spider-Man arrives and saves them. Afterward, Norah visits Harry in his coffee shop, and notices a bottle of oxycodone in Harry's things. Troubled by what she finds, Norah concludes that Harry has a drug problem and resolves to help him through it. After many near encounters, Carlie Cooper and Peter Parker meet at the coffee shop. Harry and MJ are there and the four are talking when Lily bursts through the wall, followed by an attacking team of supervillains. MJ asks Harry to help Lily Hollister who's gone into labor, but they are held captive by Doctor Octopus. Spider-Man manages to save them and rescue Lily's newborn baby from supervillains. Harry and MJ take Lily to get medical care, but Carlie was too angry with Lily to accompany them. When Spider-Man secures the baby from Doctor Octopus he runs an analysis on a sample of the baby's DNA and finds it matches Harry. Spider-Man encourages Harry to raise his son on his own and start a new life. Soon thereafter, Harry prepares to leave New York with the baby named Stanley. At his going-away party, Harry encounters former NYPD officer Vin Gonzales reveals he has a Green Goblin tattoo. After Gonzales relays a message from Norman, Harry shocks the man with a taser and beats him. Months later, Harry is shown in Seattle, Washington living with his son. He is shown to have completely changed his appearance, having shaved his head and grown a beard. As part of the All-New, All-Different Marvel branding, Harry Osborn started using his mother's maiden name of Lyman and has started working at Parker Industries where he is in charge of Parker Industries' New York office when revealed to the Human Torch by Spider-Man. His sons Normie and Stanley likes Regent, until the time when all super humans are disappearing without a traces caused by a super human known as The Regent, while Harry is meeting with Mary Jane and Betty Brant, Harry stumbles upon seeing a same logo as The Regent on Augustus Roman's Empire Unlimited company, and soon realize, along with Mary Jane that when he saw a logo beneath Augustus' ripped shirt during the time of Zodiac's attacks on the opening of Horizon University that Augustus is in fact Regent, thus sending Betty to meet Augustus to prove if he's Regent or not. 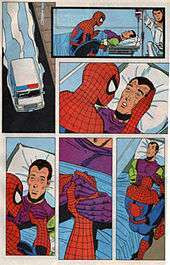 As Harry realize that Augustus kidnaps Betty, Harry must do it himself to save Betty and the other captured super humans, knowing that he may be captured soon enough, but manage to contact Spider-Man with Parker Industries' webware created by Clayton/Clash before Regent captures him immediately. With a portion of Clayton's Clash soundwave tech on Parker Industries' webware, Harry manage to break free and contact Spider-Man again before the Empire Unlimited's guards captures, until Spider-Man arrived, and soon released other super-humans and Betty, surrounding Regent for good. For most of his life, Harry Osborn had no superhuman abilities. After exposing himself to his father's formula, he takes the reins of the second Green Goblin, causing him to become much stronger, cunning and agile. The glider he carries has swords, along with usual Goblin technology. He also had temporary access to the American Son armor. In the MC2 universe, Harry's death in Spectacular Spider-Man Issue 200 remains valid and he does not return from the dead. His widow Liz continues her relationship with Franklyn Nelson and raises her and Normie (Harry's son), but she later succumbs to a fatal illness, her death sends Normie over the edge and, like his father before him, takes up the Green Goblin mantle and vows revenge on Peter Parker. After several emotionally charged encounters with Spider-Girl, Normie eventually reclaims his sanity and the blood feud between the Parkers and the Osborns is finally brought to an end. The Ultimate Marvel incarnation of Harry Osborn is the rich son of Norman Osborn and Martha Osborn as well as a friend of Peter Parker at Midtown High. After Norman eventually subjects himself to the Oz Formula, the Green Goblin kills Martha and attempts to kill Harry. Harry is placed into a relative's custody but he eventually returned to his father and is brainwashed by Miles Warren to forget the previous events. During another battle with Spider-Man, the Sinister Six and the Ultimates in front of the White House, Harry stops his father and he is taken into S.H.I.E.L.D. custody. He is later used as Nick Fury's bargaining piece to negotiate with Norman. Harry begins to blame everyone around him for the situation, and his second personality Shaw introduced by his father after many years of hypnotic therapy begins to take control. Harry eventually becomes the Hobgoblin. Harry tries to stop himself during a battle with Spider-Man but Shaw takes over and is wounded by S.H.I.E.L.D. soldiers. He is once again used by S.H.I.E.L.D. to attract his father, but the two end up doing battle which leaves Harry dead. Peter later makes a speech that honors his friend. When Green Goblin reveals that OZ formula gives him and Spider-Man an immortality, it is possible that Harry still alive somewhere. In Marvel Zombies: Return #1, Zombie Spider-Man is taken to an alternate reality where it's the past and Peter is still in college, Harry and Gwen are alive, etc. Harry is shown hanging out (with a mustache) with Peter, MJ and Gwen. However, he is later shown being eaten by a zombiefied Sinister Six, along with his friends. In the simplified re-telling of the Clone Saga, Harry secretly survived his final battle with Spider-Man and has Kaine under his employment. He appears to still be mad from the goblin serum and clones his deceased father, who apparently was indeed killed by his goblin glider in this reality. Harry soon heads out to attack Ben Reilly in the guise of the Green Goblin. His plans are thwarted when Kaine switches sides. The Norman clone, who is not insane due to not being exposed to the Goblin serum, tries to convince Harry to stop before sacrificing himself by jumping in front of the moving Goblin Glider (akin to Ben Reilly's death in the main universe). The series concludes with an irate Harry swearing vengeance. In this version, Harry Osborn was a social outcast at high school. Peter Parker said that rumor has it that he tried to burn his old prep school down. Flash Thompson bullies him and nicknames him the "Green Goblin" based on his wealth and when people saw him carrying role-playing dice. Gwen Stacy and Peter befriend him out of pity, and Harry asks Gwen out to the prom, angering Peter. He witnesses Peter transform into the Lizard, fight Spider-Woman and die. At Peter's funeral, he feels guilty that he didn't do anything to prevent Peter's death, and disappears from school for two years. He returned one night to Gwen at the cabin of Mary Jane Watson's aunt to reveal to her that he joined the army and S.H.I.E.L.D. after Peter's death and plans to avenge him by taking down Spider-Woman. He also learned to pilot a glider similar to the one the Green Goblin uses in the main universe. Harry Osborn is first mentioned in the 1981 Spider-Man cartoon. Harry Osborn appeared in Spider-Man: The Animated Series, voiced by Gary Imhoff. In the series, Harry became attracted to Mary Jane Watson due to Peter Parker neglecting MJ. Mary Jane subsequently left Peter for Harry. They became engaged, although she eventually called off their engagement realising she was in love with Peter. When Norman Osborn was apparently killed in an explosion at Oscorp, the Green Goblin began kidnapping Oscorp's board members. Harry was initially suspect to be the Goblin, but it later turned out that his father had survived the explosion and was the villain himself. Harry is later contacted by the Goblin trapped in limbo. The Goblin's visions had him take the Goblin serum and exact revenge on Spider-Man, with the promise to see his presumed deceased father. But Spider-Man defeated the second Green Goblin and he was enrolled at Ravencroft to receive treatment. When Peter and Mary Jane were getting married, Harry discovered this and his insanity broke out once again. The second Goblin interrupted the wedding and threatened to destroy the church, trying to force Mary Jane to marry him instead of Peter. In the end, Liz Allan appeared to the second Goblin, convincing him not to blow up the church nor marry Mary Jane. Told by Liz that he was loved, Harry walked away peacefully and let the wedding resumed. Harry Osborn appeared in Spider-Man: The New Animated Series, voiced by Ian Ziering. This version, pictured as a blonde, constantly blames Spider-Man for his father's death but shows signs of beginning to put the grudge aside in later episodes. Harry Osborn appears in The Spectacular Spider-Man, voiced by James Arnold Taylor. This version is Peter Parker's friend/high school classmate and Norman Osborn's disappointment of a son. He spends much of his life trying desperately to earn his father's approval. Harry takes the 'Globulin Green' serum to boost his physical abilities but apparently causes the development of a second personality which symbolizes his notion of "the man his father wanted him to be". Following several battles, Spider-Man comes to believe Harry is the series' iteration of Green Goblin but allows Norman to look after his son. After being on a European tour to help break his addiction to the serum, Harry returns from his trip. After Flash Thompson exposed Harry's addiction to league administrators and loses the trophy their team won as a result, Harry destroys the remaining 'Globulin Green' vials he kept hidden. Soon after, Harry attempts to have a relationship with Gwen Stacy though he expressed some anger after overhearing Gwen talking about breaking up with him to Peter. During the series finale, Harry learns the truth of Norman being the Goblin all along as he witnesses Norman fight Spider-Man up to his father's supposed death. At his father's "funeral", Harry blames Spider-Man for his father's "murder" and has Gwen stay in their relationship out of guilt. Angry and possibly mentally unbalanced, Harry swears vengeance on Spider-Man. This storyline, however, was never resolved as copyright issues led to the show's premature cancellation. Harry Osborn appears in the Ultimate Spider-Man cartoon series, voiced by Matt Lanter. This version is one of Peter Parker's best friends, Norman Osborn's estranged son, the series' first incarnation of Venom, a student at Midtown High School, and a friend/acquaintance to both Mary Jane Watson and Flash Thompson. In season one, he gets badly injured by Klaw while trying to protect Mary Jane from the Frightful Four's assault on Midtown High (in "Great Power"). In "Venom", Harry is then jealous of Peter's 'new friends' so he throws a huge party that gets crashed by the Venom symbiote. Harry was also among Taskmaster's suspects with Flash of who could be Spider-Man (in "Why I Hate The Gym") and tries to cool to Mary Jane's video interview (in "Exclusive"). In "Back in Black", Harry bonds with the organism to be the Black Suit Spidey in an attempt to one-up Spider-Man to impress Norman but the symbiote's personality takes over Harry and transforms into Venom until Spider-Man electrocutes and disintegrates the organism off Harry. However in "Venomous", the organism managed to return and with Harry having no memory of Venom's recent actions. Both Spider-Man and Norman try to help him without exposing his status as Venom's host to the web-slinger's teammates. Eventually, Spider-Man's cure supposedly works on Harry with Norman's resources taking of his son. In the season finale, Harry is taken to the S.H.I.E.L.D. Helicarrier during the Green Goblin's rampage. The chaos and confusion from the fighting caused the Venom symbiote to reveal itself and comes into form after the Goblin's provoking. Although he eventually manages to shake off the parasitic suit with electricity, Harry swears vengeance on Spider-Man for his father's fate. In season two, Harry has several encounters with Spider-Man. In "Carnage", he watches the Goblin kidnap Peter to be forcibly transformed into Carnage. Although Harry stops Carnage and saves Peter by rebonding with the symbiote, Venom feeds on Harry's dark desires, attacking the Goblin until Peter manages to convince Harry to get rid of the symbiote, to which S.H.I.E.L.D. manages to capture to ensure no more harm. In "Stan By Me", he and Mary Jane help a showdown Spider-Man and Stan the Janitor has with the Lizard. Harry tries to deal with Spider-Man about his father's well being (in "Venom Bomb" and "Second Chance Heroes"). He has a minor role in Ultimate Spider-Man: Web Warriors. Harry is the Vulture's accidental target despite Spider-Man's attempts (in "The Vulture"), and is relieved that his father is now cured from being the Goblin when he and Peter visit (in "The Spider-Verse" [Pt 4]). Harry Osborn has a supporting role in Ultimate Spider-Man vs The Sinister Six. In "Hydra Attacks", Harry finds out that Doctor Octopus was the one who created the Goblin serum and infected his father into a Goblin. During the Sinister Six's invasion in cooperation with an international terrorist organization, Harry was close on becoming a candidate into a new Green Goblin by Doc Ock after his reformed father develop an anti-Goblin serum until Spider-Man and Scarlet Spider managed to rescue the Osborns from Doc Ock's Goblin army, and helps the two web-slingers with anti-Goblin serums against the Goblin army. In "Iron Vulture", Harry wears an American Son-like armor (as The Patrioteer) to help Spider-Man, Iron Patriot and Kid Arachnid fight Doc Ock and Vulture. In "Anti-Venom", Patrioteer help Spider-Man and Agent Venom against Doc Ock. During a fight, he becomes the host for Anti-Venom. Anti-Venom nearly kills Agent Venom only to be stopped by a ion inhibitor by Spider-Man and Iron Patriot which leaves Anti-Venom unconscious. Harry is left in a coma with Curt Connors not knowing if Harry will recover, though Harry has strong life signs. In "The Symbiote Saga" three-part episode, Harry shown at Oscorp still in a coma with Mary Jane at his side. When the Carnage-infected civilians break in, the attack ends up awakening Anti-Venom to neutralize the Carnage symbiotes on the civilians. At the Carnage outbreak's core, Anti-Venom almost gets consumed by Carnage's 'heart' until Spider-Man reveals being Peter to get through to Harry. Harry then sacrifices the Anti-Venom's abilities to stop the Carnage outbreak. Afterwards, Harry learns that Flash is Agent Venom. After Carnage envelops Midtown High, he returns in his Patrioteer armor to help Spider-Man and Agent Venom to stop Michael Morbius and the Carnage Queen. When Patrioteer, Spider-Man and Agent Venom reveal their respective identities to break Mary Jane's connection with the Carnage symbiote. In the end, Patrioteer is with Spider-Man and New Warriors in the Triskelion. James Franco as Harry Osborn / New Goblin in Spider-Man 3. In the 2002 film, Harry is Peter Parker's closest friend. He is embarrassed by his wealth and privilege, and has flunked out of multiple private schools. Yearning to impress his father Norman Osborn, he grows jealous of Peter's close relationship with him. He dates Mary Jane Watson during the film's first half, though she eventually falls for Peter and he manages to mend his relationship with his father. After his father's death as the Green Goblin, Harry believes that he was murdered by Spider-Man and wants to seek revenge, unaware that Norman accidentally killed himself in a failed attempt to kill Spider-Man. In Spider-Man 2, Harry takes over Oscorp and forms an alliance with Doctor Octopus to get his revenge, providing the villain with a rare element he needs to complete his fusion reactor in exchange for Doctor Octopus's capture of Spider-Man. Afterwards, he learns that Peter is Spider-Man after unmasking the hero in preparation to kill him. Harry later has a hallucination of his father, demanding that his son avenge him. He refuses and smashes the mirror, only to find a hidden room with Green Goblin equipment and serum; he then realizes that his father was the infamous supervillain. In Spider-Man 3, the character is now the New Goblin. New Goblin attempts to take revenge, but briefly sustains amnesia after Peter knocks him unconscious during their first battle. While in this state, Harry reverts to his old self, however, he sees a vision of his father. Remembering his pledge to kill Peter, New Goblin attempts to destroy Peter by sabotaging his relationship with Mary Jane and then claiming that she left Peter for him, only for Peter — falling increasingly under the Symbiote's influence — to attack New Goblin in his penthouse, throwing one of his own pumpkin bombs back at him and scarring the right side of his face. After learning the truth of his father's death from his butler, Harry helps Spider-Man save Mary Jane from Venom and Sandman, and ultimately sacrifices himself to save Peter by being impaled on his own glider by Venom. Spider-Man then uses one of New Goblin's pumpkin bombs to destroy Venom. Harry dies with Peter and Mary Jane at his side. Dane DeHaan portrays Harry Osborn / Green Goblin in The Amazing Spider-Man 2 in the film. This version is Peter Parker's childhood friend until being sent to boarding school in Europe. Learning that he's dying of Norman Osborn's terminal hereditary illness, Harry attempts to ask Spider-Man for a blood sample, correctly deducing that Spider-Man's powers come from Oscorp's genetically-engineered spiders that have since been destroyed. But Spider-Man (both as Peter and Spider-Man) refuses, fearing that the transfusion could mutate Harry. Spider-Man insists for more time for research though Harry refuses to wait. When Harry is forced out of his own company as a scapegoat for Oscorp's role in Electro's creation, he breaks into Ravencroft to release Electro and asks for aid. Electro causes a distraction while Harry uses VP Donald Menken to break into Oscorp's special projects division to recover the remaining venom samples and uses one which hideously mutates his physiology, steals Oscorp's battle suit and glider. Now the Green Goblin, he sets out to kill Spider-Man and he sees Gwen Stacy alongside. With knowledge that Gwen and Peter have been dating, the Goblin realizes that Peter and Spider-Man are the same person. As retaliation for refusing to help, the Goblin grabs Gwen and fights Spider-Man in a clock-tower, the fight culminating in the Goblin being knocked unconscious and Gwen's death. Five months later with Spider-Man's apparent retirement, Harry was sent to Ravencroft for his crimes and regains his normal appearance, though he claims the hideousness "comes and goes." He and the mysterious Gustav Fiers make plans to use the rest of the equipment in special projects for their own ends, planning to create a small team. Dane DeHaan was set to reprise his role in The Sinister Six and The Amazing Spider-Man 3. However, with a reboot to the Spider-Man franchise underway, these films have been put on hold and canceled, respectively. Harry Osborn appears in the Spider-Man video game, voiced by Josh Keaton. Though he doesn't play a major part in the main plot, the game features a bonus story mode where Harry takes on the Green Goblin role and investigates a plan to take over Oscorp. Harry Osborn appears in the Spider-Man 2 video game, again voiced by Josh Keaton. Like in the movie, he's obsessed with killing Spider-Man for his father's murder and goes as far as asking Doctor Octopus to capture Spider-Man. New Goblin appears in the Spider-Man 3 video game, voiced by James Franco. He tries to take out Peter Parker as a boss and later assists in dealing with Sandman and Venom as a playable character. He is also a downloadable character on the game's Xbox 360 version. In the game's limited PlayStation 3 edition, he is unlockable and is downloadable for the normal version as well. New Goblin appears in Spider-Man: Friend or Foe, with Josh Keaton reprising his role. Harry Osborn / Green Goblin appears in 2014's The Amazing Spider-Man 2, voiced by Kevin Dorman. Like his film counterpart, he also takes on the role of the Green Goblin. However, Harry is still the CEO of Oscorp, and very cautious after finding out that Donald Menken and Kingpin are attempting to do a hostile take over for a criminal empire behind Harry's back. When Spider-Man tells Harry about research and test the cure compatibility between his and Harry's blood samples might take too long a bit, Harry turns down Spider-Man's suggestion and instead, doing his own to find an existing cure within Oscorp. Before finding the cure without alerting Menken's signals, Harry hires some of his colleagues who joined Kingpin's Task Force only for a money, and in turn, they will assist Harry to kill Kingpin, Menken and Spider-Man. As the researcher from Oscorp finds a prototype spider-venom serum from the late-Richard Parker, Harry is advised by the researcher a same thing what Spider-Man suggested Harry to, but Harry ignores the researcher's advice, and will take any chance to use immediately, even if the serum hurts him. ↑ Manning, Matthew K.; Gilbert, Laura, ed. (2012). "1960s". Spider-Man Chronicle Celebrating 50 Years of Web-Slinging. Dorling Kindersley. p. 31. ISBN 978-0756692360. This monumental issue saw the first appearances of Peter's upcoming love interest Gwen Stacy, prospective best friend, Harry Osborn, and even the future super villain known as the Jackal.